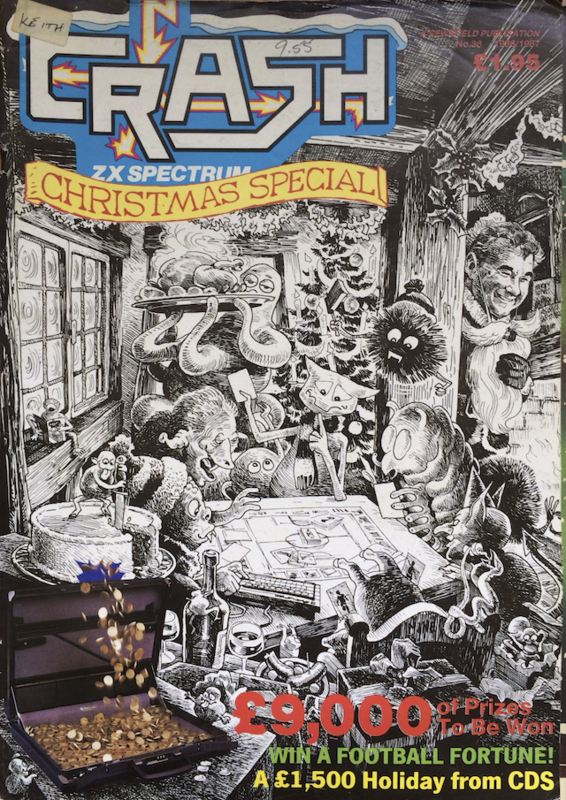 Lloyd Mangram took a lengthy look back at the Crash mags of 1986 and the big events and games in the Spectrum scene. Mel Croucher began a fictional series called "Tamara Knight" that would grace the pages of Crash throughout 1987. Staff of Crash, ZZap and Amtix challenged each other to a series of gaming contests. Julian Rignall (ZZap) was pipped to the post by Ben Stone (Crash), with the Amtix contingent trailing far behind. Denton Designs had been one of the darlings of the UK game industry, but things looked decidedly shaky early on in 1986 when they delivered a right stinker of a game ("Transformers") and the founders left the company. Julian Rignall talked to the remaining members, and to the founders who had gone on to pastures anew. Money was the main problem - they just weren't earning enough from their games to support a relatively large programming staff. One of those who left, John Gibson, had struck a solo contracting deal with Ocean doing arcade ports and said: "It was great when we started, and we had loads of ideas about being a software development house. At first it was like us versus the rest of the world, but after a while both Steve and I got disillusioned. There was too much turmoil in the office with too many meetings. All I wanted to do was write programs and I felt that I was getting too wound up by the difficulty of running a company." There was an interview with Roger Kean, the man behind Newsfield's new publication, LM. "Uchi Mata" Martech - "Before any of you think, 'just another martial arts game', and turn to the next page, there's no getting away from the fact that Uchi Mata from Martech looks pretty special." "Cosmic Shock Absorber" Martech - "For a mere £7.95, Cosmic Shock Absorber offers some pretty good blasting with lots of colour and action." "Xevious" Probe/US Gold - "It looks like the Spectrum is going to be host to yet another arcade conversion, this time it's the cult classic Xevious." "Aliens" Soft Machine/Electric Dreams - "With over two hundred rooms, this game looks like being a tough combination of reflexes, planning and strategy." "Shadowskimmer" The Edge - "Shadowskimmer from The Edge should be around early in the new year and promises to be similar to Uridium but with more colour and detailed graphics." "Cop Out" Mikrogen - "This is good harmless shoot-em-up fun, which should be ready for release around the end of the year." "Annals of Rome" PSS - "Once again, PSS has come up with a new angle in strategy games." "Footballer of the Year" Gremlin - "According to Greg Holmes, one of the programmers working on the project at Gremlin, it is a strategy game with arcade elements." "They Stole a Million" 39 Steps/Tigress Designs - 85% "Gosh, this game is good! The windowing system is superbly done, and the whole game is definitely one that has been put together very well indeed." "Starglider" Realtime/Rainbird - 48K 95% 128K 97% Crash Smash "it's hard to imagine a better shoot em up." "Starglider on the 128K is far, far superior to the 48K version and indeed to any other 128K games that I've seen to date." "Nosferatu" Design Design/Piranha - 91% Crash Smash "To begin with it is very easy to dismiss Nosferatu as just another filmation game with hardly any content, but if you stick with it for a few goes I'm sure that it will absorb you as completely as it did me." "Contact Sam Cruise" Dave Reidy/Microsphere - 93% Crash Smash "Just when I thought The Great Escape was about as far as the arcade adventure could go, this comes along." "Jewels of Darkness" Level 9/Rainbird - 94% Crash Smash "Jewels of Darkness is a classic trilogy and a collectors item for connoisseurs and laymen alike. Given the untold damage to the market, in terms of unimaginative structures and stories, wreaked by The Quill, these programs are at once a return to traditional adventuring and a breath of fresh air." "Kwah!" Melbourne House - 86% "Unusual, highly polished game." "Avenger" Gremlin - 85% "Another good Gauntlet clone." "Academy" Pete Cooke/CRL - 92% "The game graphics, while being similar to those of Tau Ceti, are still brilliantly rendered, and the whole thing is just extremely playable." "Kat Trap" Design Design/Domark - 84% "A humorous little shoot-em-up."